Manage your bookings discounts program! Set discount values when a client is booking a specific number of days/hours. You need to select the discounts you want to use in calendar settings. Same discounts can be used in an unlimited number of calendars. Step 1 - Click the "plus" button to add a new discount. After you clicked the button, the discount will appear in the list below. Step 1 - Select the discount from the list to display the information. 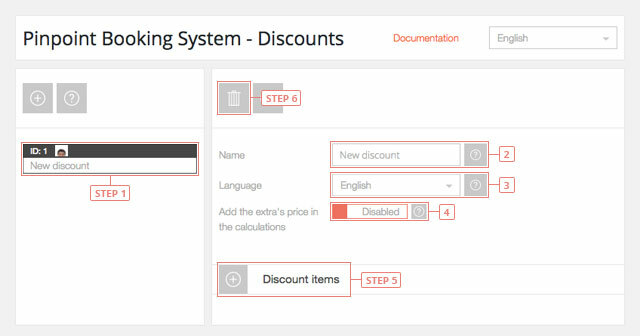 Field 3 - Change to the language you want to edit the discount. A discount item contains the data for a booked time lapse. The order of the items gives usage priority. The last item has a higher priority. Field 4 - Enter item label (will be seen by clients). Field 5 - Enter the number of days/hours for the beginning of the time lapse. Leave it blank for it to start from 1 day/hour. If you apply it to a calendar that uses day it will mean days, if you use hours in your calendar it will mean hours. Field 6 - Enter the number of days/hours for the end of the time lapse. Leave it blank to be unlimited. Field 7 - Select item price operation. You can add or subtract a value. Field 8 - Enter item price. Field 9 - Select item price type. It can be a fixed value or a percent from price. Field 10 - Select item price by. The price can be calculated once or by day/hour. Button 11 - Add discount item rule. After you clicked the add button, the discount item rule will appear under it. A discount item rule sets the discounts for a specific time period. The order of the rules gives usage priority. The last rule has a higher priority. A rule will also overwrite item data. Button 1 - Delete rule. 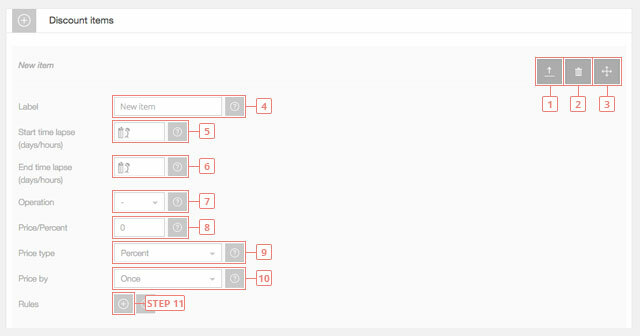 Button 2 - Sort rule. Field 3 - Enter the rule start date, when the discount item rule will start being used. Leave it blank to start from today. Field 4 - Enter rule end date, when the discount item rule will stop being used. Leave blank if you do not want to have an end date. Field 5 - Enter rule start hour, when the discount item rule will start being used. Leave it blank so that the rule will begin from the start of the day. Field 6 - Enter rule end hour, when the discount item rule will end being used. Leave it blank, so that the rule will expire at end of the day. Field 7 - Select rule price operation. You can add or subtract a value. Field 9 - Select rule price type. It can be a fixed value or a percent from price. Field 10 - Select rule price by. The price can be calculated once or by day/hour.